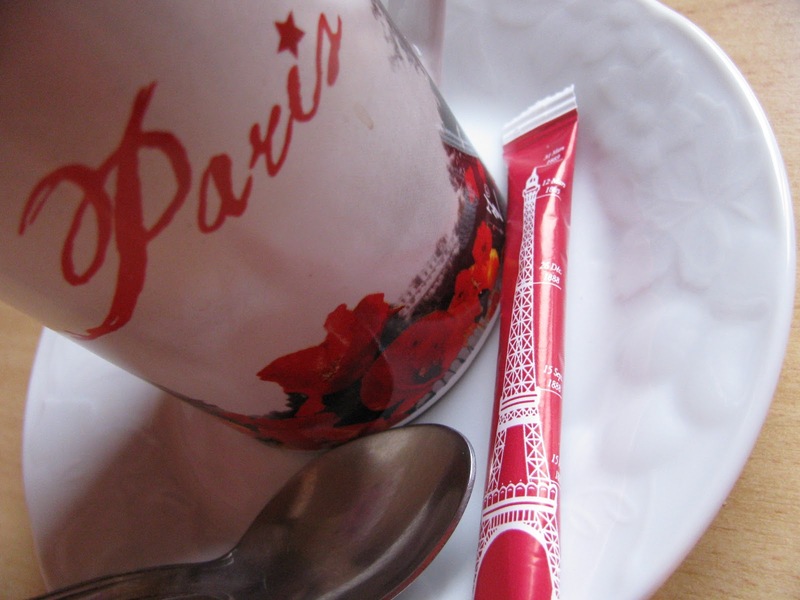 What does that little tube of Eiffel Tower sugar have to do with today's post? Laury bought a box of them the last time we went grocery shopping; she gave me a handfull to have on hand for coffee or tea. I tucked a few into a packet that I mailed to my friend, Randi a little over a week ago. Randi requested a French newspaper, and I knew I couldn't send that without a some other 'bits & pieces' of France. So besides a few tubes of sugar and her newspaper, she also received a book of French language stickers for her kids, a postcard, and a few euro coins. I had a lot of fun deciding which bits and pieces of France to share and putting her packet together over a glass of wine at le President in Cajarc. Sharing bits and pieces of France is what this blog is all about; I loved sharing a few with the Dukes' family as well! I don't have a clue what Randi will do with the newspaper, but knowing my very creative friend it will be fun and beautiful. And isn't that coffee mug cute? That's a bit of France that Laury gave me. Red and Paris....two of my favorite things! A few of the sugar tubes are embellishing my little jar of espresso spoons ... I'm thinking those little tubes might get a prominent spot at an upcoming party. I love them! The package was so fun to get ... thank you! If there is a Paris or French theme party in your future, let me know and I'll send you some more!